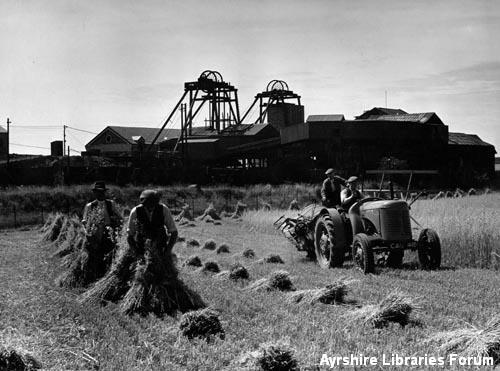 Men with 1948 registered tractor, harvesting oats at Shields Farm, Prestwick Park, 1950-51 with the winding houses at Glenburn Colliery in the background. A compulsory purchase was made in 1960 to create the second runway. The photograph is part of a collection known as the Harrison collection. He was commisioned to photograph the Auchincruive Collieries of which Glenburn 1911 - 1973 was Auchincruive No's 4, 5, 6 & 7.